There are many website valuation tools and software programs available for users who are interested in purchasing or selling websites. Many of them take public data such as a website's Pagerank, Alexa rank, search engine indexation or listings in Wikipedia, Dmoz or Yahoo Directory. These website valuations usually take less than a minute to complete but differ widely in their evaluations since interested users can usually not enter other factors like website traffic, monthly revenue or expenses. That's where the website valuation software, or lets say website valuation service, Ebizvaluations comes into play. The service requires data that can only be known to the owner of the website or to a seller who has either seen the information on a website (like the website selling platform Flippa) or who has been in contact with the owner of the property. Data that has to be entered include the monthly income and expenses, the months the site has been making that income and the type of site. There are additional - but optional - fields that can be filled out including the number of monthly uniques and pageviews, the members, the uniqueness of the content and the skill required to run the website. All of these information will be taken into account plus the information that can be gathered from public sources including the Google Pagerank, Alexa rank and Compete rank. 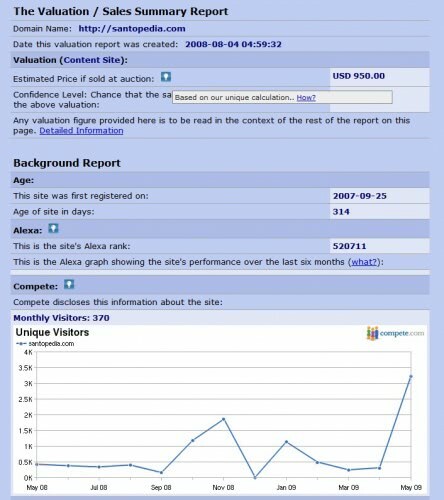 The website report will list all computed background information plus an estimated valuation of the website. The valuation is usually more precise thank those of automatic website valuation tools thanks to the additional data that is entered by the user. The only difficulty that users can experience is the need to acquire the data that needs to be entered. It usually is not a problem to gather the data from website auctions but it could be for websites that are not up for auction. wow… the information is really cool. Just valuated my site… really impressed. Nice share. Thanks. Also, you could use the http://www.websitepricer.net free service to price a website.. These tools are nice gadgets but they don’t tell you much. the valuation of an object (company, painting website e.g.) are best done by humans using models they can understand and manipulate. Case is different. If valuations where easy we would not have a financial crisis.